Post weekend perspectives : The Pro and the Rookie. The CX Fever project is now behind us and we thought we would look back at how it went by asking Maghalie and Hannah, the pro and the rookie, to share their perspective on the experience with us. When I first got the idea about the CX Fever project, the whole goal was to help someone else. I wanted for a young girl to experience a race weekend as if she was a professional racer. When you are a young racer in the U23 category, wether or not you have a team and support at the races can be the deal breaker that make you decide to keep at it and try to become a professional, or to be discouraged and stop racing. The idea behind the project was to give someone a glimpse of what it really is to be part of a team in order to inspire them to keep going and motivate them to work hard to achieve their goal. I also wanted to use this opportunity to share some advice about racing and introduce that person to as many people as possible in the cycling industry. As I said, the goal was to help someone else, but I didn't expect that I would be the one to benefit and learn the most from the experience! As it turns out, in many ways, wanting to help someone else forced me to bring out the best version of myself during that weekend. Having Hannah around forced me to reflect on how I could try to help her the most; which brought me back to the basics. Sometimes, I think that when we get comfortable doing and repeating a task, it becomes such a natural routine that we tend to forget the basics steps. Those basic steps are the things we used to pay attention to when we weren’t as experienced, because focusing on those small things was the only way we could possibly achieve the task at hand. They are often the most important things though; the ones that made us good in the first place and that are still crucial if we want to keep performing. For example while pre-riding the course, I was forced to slow down a little bit to look at some sections and share some advice with Hannah, which helped me see things I probably wouldn't have noticed on my own normal pre-ride. Having Hannah also encouraged me to re-think my pre-race routine, which forced me to reconsider some things that don't necessarily make sense, but that I do for the oh-so-great reason that "I've always done it that way". It helped me to be more organized, to take care of myself better, to stay positive at all times, and way more. During the race, at some point, as I was getting dropped and my body was feeling super empty and flat, I had a great battle with myself. I was hurting really bad and I wasn't going fast at all, but I had spent the whole weekend telling Hannah to focus on things she could control, rather than on the distractions on which she had no control over. So I had to talk to myself: "Come on Magh. Don't be that person who tells the others to "do what I say, not what I do!". So I followed my own advice. I focused on my pedalling rhythm and on relaxing my upper body, rather than ranting about the fact that my legs hurt..."It's a freaking bike race! Your legs are supposed to hurt, Magh! Focus on your cadence, look up, breathe!" Thanks to Hannah, I had that pep talk with myself which helped me stay positive and allowed me to actually have a good performance, even if my body wasn't responding so well. At the end of the weekend, I had learned so much that I even wondered if Hannah had been able to benefit from the experience at all. Had this whole thing been a super selfish act on my part? Did she even like the experience? At least, I was hoping she had as much fun as I did. Hannah Bauer: CX Fever Recipient. Coming into the weekend, honestly, I wasn't really sure what to expect. But it turned out to be an incredible experience. I think the thing that surprised me the most was the fact that Maghalie was just like all the other racers. 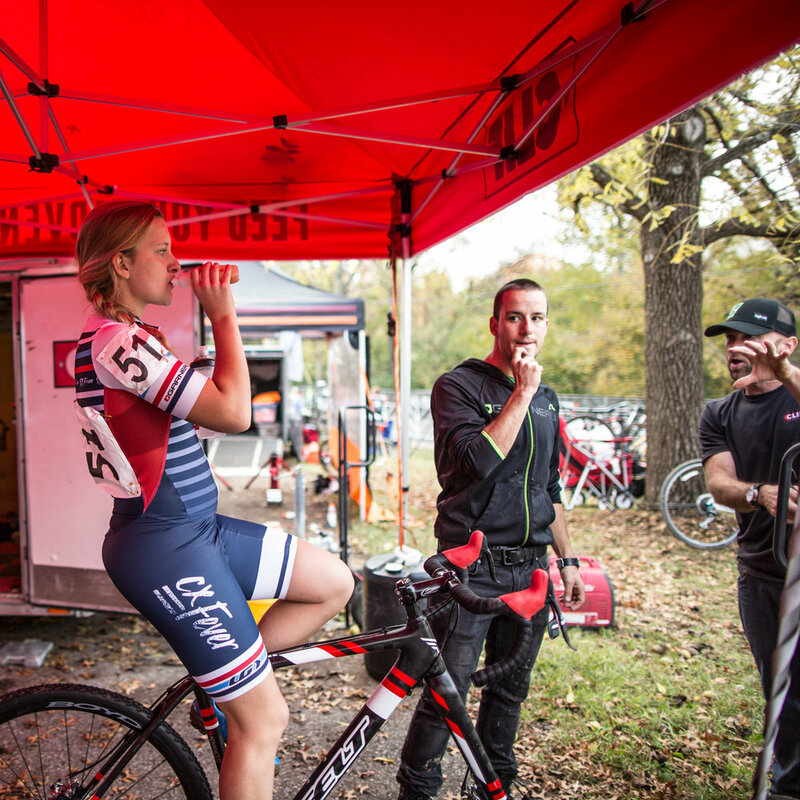 Regardless of how great of a bike racer she is, she still faces the same things that I do. It was nice to have someone who has already gone through the same things I have and receive advice on how to deal with it. However, the most important part of this weekend, for me, was that it was not "result driven" but more "goal driven". Despite nerves and being encompassed in a completely new atmosphere the weekend of a big race, Maghalie helped me to overcome some of my fears and to focus more on aspects that I can control, like looking ahead, staying focused, and keeping a positive mindset. The CX Fever Fund allowed me to step back and pay more attention to "minor" details that can often determine the outcome of a race. One of the biggest challenge for me was that the course was so difficult! I haven't had a race like this one yet this season, so it was a challenge to handle both the course and my nerves at the same time. But the whole point of the CX Fever Fund is to encourage girls like myself to continue racing, not for the results, but for the love of the sport. In a sport that is so competitive, it is often difficult to remember why I began in the first place. This weekend allowed me to take a step back, remember all the reasons why I love to ride my bike, and wear the CX Fever Kit with pride. As an aspiring professional cyclist, this weekend was definitely eye-opening. The support that these athletes receive is incredible, but it isn't always easy. Maghalie is 110% devoted to the sport of cyclocross and is extremely passionate about it. I aspire to continue to love riding my bike and share my passion with others, wherever that may lead me. One thing is for sure though: I will always have the fever! I am so excited to be racing back in North Carolina this weekend and for the rest of the season, but so sad that I will not be sporting the CX Fever Kit! Looking back, I think that in our own way, we both had a great weekend and we both benefited a lot from the experience. After all, maybe that is the biggest lesson of all? We are all different, we all have different goals, different knowledge and we all have different perspectives. But maybe by embracing our differences and by sharing and interacting together, we all learn things from one another that we never would have learned if we hadn't taken the time to share with others. I truly hope we get to share and exchange more experiences like this, in the future. Newer Post2017 season in random shots.